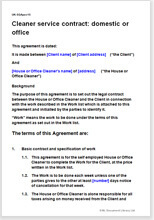 Simple service contract for self employed house or office cleaner working in home or office of client. You may work in your own name or through your company. It is assumed that the cleaning work will not be unusual. Main purpose of contract is disclaimer of liability for your work and set the terms for avoiding conflict. Just add specification for actual cleaning work and you have contract form suitable for private client who will be happy to sign a simple contract. Simple service contract for self employed house or office cleaner working in home or small office of client. You may work in your own name or through your company. It is assumed that the cleaning work will not be unusual. Main purpose of contract is disclaimer of liability for your work and setting the terms for avoiding conflict. Just add specification for actual cleaning work and you have contract form suitable for private client who will be happy to sign a simple cleaning contract. As a cleaner, you need protection. If you have not arranged for up front payment you are always at risk that your client will not pay. We give you the option of several alternative payment procedures from all up front to all on credit. Limitation of liability also features large in this contract. This document was written by a solicitor for Net Lawman. It complies with current Australian law. "I've used Netlawman twice (my business is in Australia) and both times I've found them to be very knowledgeable, patient, and to give considerable thought to the details of the agreements I needed developed. I will be using them again for a variety of future projects and I highly recommend them for any business looking for high quality, affordable legal document solutions. " "This site is a great idea.. This makes legal forms so much faster and cheaper!" "Comprehensive, Simple to understand and Easy to use. A site for both busy professional and general use. I wish there were more."